Report by Eswar Anandan, January 16, 2016, Mumbai. 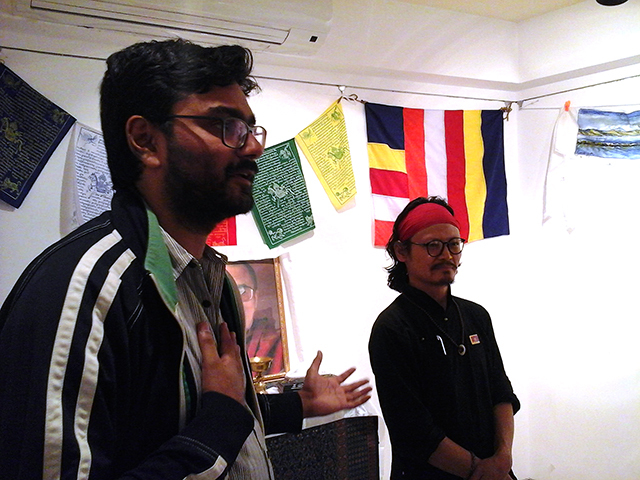 Theatre personality Quasar Padamsee introduces Tibetan Poet and Activist Tenzin Tsundue to the gathering at a programme organised by Friends of Tibet at Kala Ghoda, Mumbai on January 16, 2016. 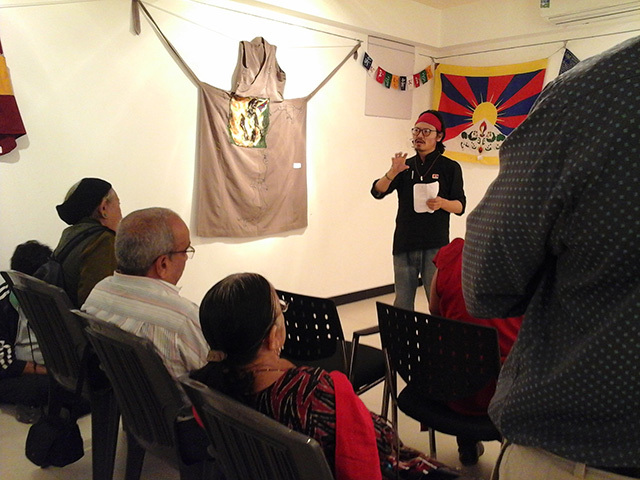 Tibetan Poet and Activist Tenzin Tsundue graced "Tibet Dreams" exhibition and spoke to a gathering of Tibet supporters and art enthusiasts on the topic "Tibet In The Era of Globalisation" at a programme organised by Friends of Tibet at Kala Ghoda, Mumbai on January 16, 2016. Theatre personality Quasar Padamsee introduced Tenzin Tsundue to the audience and welcomed the gathering. Tenzin Tsundue spoke at length how the modern countries and civilisation is more defined by power of money and economic policies than what it used to be earlier — better administration, military expertise and empire building. How corporate companies are ruling the helm of affairs and playing an important role in shaping people's intellects, sensibilities and even aesthetics. He explained how globalisation has led to homogenisation of people's ideas, aesthetics and common interest. Across the globe people aspire for non-violence, peace — everyone wants to see, practise and live with, but being consumeristic we are not able to do so, we are bound by the desire of comfort and convenience. Many people ask me — 'Do you want to dedicate your entire life for a cause that is not leading anywhere?' My answer to them is that I have dedicated my life for this cause and I find deep sense of satisfaction and this satisfaction makes me more and more enthusiastic and, if not for future but for now. Peace and non-violence is not a result, it's an on-going process. It's today and now. He felt that if the Tibetan struggle took the form of a physical battle, no matter what is the result at the end, the struggle would be mired with pain to all concerned. Freedom struggle is about freeing us from hatred and anger. He went on to share that the various talks he delivers across the country is his freedom struggle, had he not believed in the power of non-violence, he would have ended up in jungles living a life of pain, carrying guns and machineries. He explained how this way of looking at freedom struggle is a very different perspective. Its day to day life that matters not the end result, He said, it's not important to us that the issue of Tibet and the cause is a news maker in the TV or if media does not carry news on the issue; what matters most is that we are free from hatred and anger. Tibet is Shangri la to all, a heaven on earth which exists against the globalisation characterised by consumers. In the present day, Tibetans in Tibet are free to do any kind of business, enjoy any kind of luxury, as long as they do not talk about their rights! The Chinese Government thinks that the Tibetans are stupid, fool-hardy, stubborn to the core that they do not understand the 'benefits' the Chinese Government is promising them and hence the Tibetans are resisting. Chinese companies which arrive in droves to bomb mountains to mine gold, silver, copper, especially lithium are welcomed by Tibetans by lying down and telling them 'Kill us before you bomb our mountains'. This attitude of the Tibetans is not understood by the Chinese Government. They say — 'why don't you take part in the machinery, you can get better place to stay, you can share the benefit of mining'. Tibetans refuse to listen and they are branded fool-hardy, stubborn, uncivilised. For us Tibetans civilisation and development is not bombing mountains and making money out of it. For us Development is developing our hearts, our minds, to understand each other and in this lies the richness of Tibetan Culture. On this aspect and value system there is a constant conflict between the Chinese Government and Tibetan people; the Chinese have lost all their culture and what is coming as Chinese in Tibet is the culture of Consumerism blind to any human aspects, with an attitude of making money out of everything — labour, mountains, air, exploiting and making as much money as possible. When the Chinese Government does not understand this, they lay down rules and regulations, amend laws and they say that if you do not listen to us, we will make you listen to us! Tibetans go on streets and protest. People who do not listen to these dictatorial terms are shot down and evidence is cleaned up within minutes; people do not even know about it! In most free countries if the ruling government does not listen to its people, people have the liberty to go to court and if law of court does not work, one can go to the media. But in Tibet, the Cops are the final word and the final decision is taken by the ruling Communist Party! The State uses Media as a propaganda machinery and the media is toothless. The media is maintained to control over people's way of thinking. People in Tibet are left with no free avenues to talk about their grievances! A constant vigil is on the activities of people and even the tourists are not spared. The people there have not seen their country free, have not experienced democracy or press freedom; they cannot understand how to inspire themselves to find inspiration to continue non-violence. This has led to a situation wherein since 2009 people have started setting themselves on fire. Resistance of Tibetans around the world is the last resistance of human beings against the machinery. When we see Tibet, we do not look at it as a country and its people, but as a common aspiration of people around the world. Tibet is caught in midst of this global trading. Industries around the world set up their operations in China. They benefit from the cheap Chinese labour. As far as natural resources are concerned, Chinese companies extract clean natural resources from occupied countries like Tibet, East Turkestan and Southern Mongolia. These occupied countries put together make 60% of China's landmass of 9.5 million sq. km, triple the size of India. Out of that, the local population in the occupied countries is only 1% of 1.3 billion. This means when China controls 1% of population with guns and machinery, they get 60% of natural resources. This is how make in China products are cheap, and this cheapness is benefitting countries around the world. Countries around the world, their economic policies are shaped by corporate companies. Therefore instead of supporting the Tibet cause, they act aggressively on the Tibetans who speak for independence of Tibet. I even fear that UN may come down on us. This is the reality. Because it's of benefit to the larger majority of population in this globe, the issue of Tibet does not come in any of the international arena, UN, media and most people don't even know about the Tibetan Cause. If some of us who believe in Tibet do not speak up, Tibet may die like Native Americans in America, or the natives of Canada or Australia. And people would not even know such a civilisation existed and people died; a part of the world would die with it. This is why we must speak up. 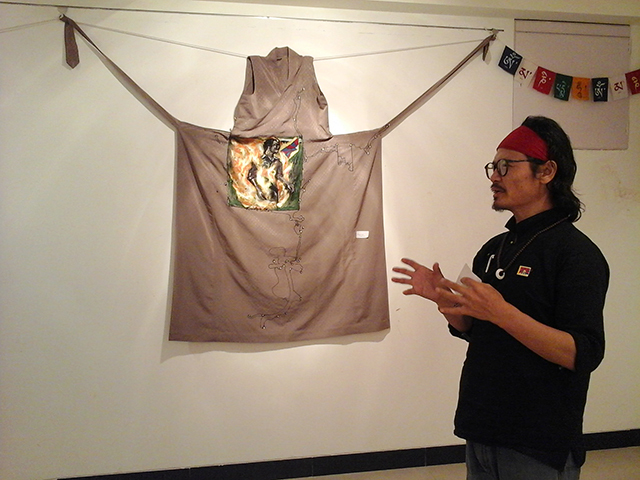 Tenzin Tsundue appreciated the effort taken by contemporary Indian artist Francis Kodankandath in bringing out Tibet Dreams in a unique way and dedicated a poem written for this occasion. If we open all our mobile phones, 40 to 45% of our mobile phones batteries are made in China. Earlier batteries were used and throw, the batteries found in mobile phones use lithium which is chargeable. China markets itself by making use of the large amount of lithium found in Tibet, which is best in quality. Another very important mineral found in abundance, best in quality is copper. The entire 1500 kilometres of river belt that flows to India as Brahmaputra is rich in copper resource. Tibet is more important for its Rivers than for the metals. Rivers from Tibet feed countries ranging from Pakistan to India, Nepal, Bhutan, Bangladesh, Burma, Laos, Cambodia, Thailand, Vietnam and China. Over 2 Billion people in Asia are fed by rivers of Tibet. In the next 15-20 years people will fight for water. Himalayas is going to be the last reservoir of fresh drinking water, most parts of this great mountain is in Tibet! People will fight for Himalayas. We are yet to know what designs America has for the Himalayas. Tibet is going to be strategically important for its rivers, and the Himalayas. There are so many reasons why China does not want to let go Tibet, the reasons are not just political, today more so for natural resources. Colonisation is very much there in Tibet today. My lessons come from Mahatma Gandhi. Gandhiji has said that the problem of drinking is not with the source but with the habit itself. On similar lines, if America and China is powerful and dictate terms with other nations, it's not because of its stature, but because of the fact that the people around the world think these countries are powerful. Much of Tibetan culture comes from India. India has its own strength; it comes from restrain not from the flow, not from animating America and China's instant gratifying industries. Tibetans in Tibet today, they laugh at the Chinese forces. Elderly women in Tibet have a friendly chat amongst themselves, not bothering the presence of the Chinese forces that carry gun and machinery. Our strength of nonviolence is much more powerful than Chinese weapons, machinery and money power. We already consider China weak. What China considers as its strength — to put coerce people to silence and buy over people — is not in actual its strength. Illegally occupying Tibet for over 60 years, China has understood that guns and machinery cannot silence Tibetans. Now China is trying to make changes in the way the control Tibetans. They are adopting systematic practises to replace Tibetan Culture. 2009 onwards, they have started to replace Tibetan textbooks with Chinese. Restriction is put on number of monks in a Monastery. The final effort is that no monastery can recognise a re-incarnate lama on their own, they must have the permission from Chinese government. These are some of the institutional mechanism with which they are trying to replace traditional methods. The same communist party meddling with Tibetan Buddhism and trying to gain control over system of recognising reincarnated lamas. They have found a way to get into Tibetan Buddhism and the whole idea of Karma and Reincarnation. The XI Panchen Lama is an example. The Panchen Lama recognised by His Holiness the XIV Dalai Lama was abducted, and the Chinese Government installed their own version of Panchen Lama. This puppet Lama was installed thinking that they could use him at the time of choosing a new Dalai Lama in future. This is the kind of politics Chinese government plays. They do not understand and they underestimate the fact that the recognition of such reincarnate lama comes out of faith not by a system. A system cannot throw up a reincarnate lama. If there is no Tibetan faith on a reincarnate lama, the lama ceases to be. It's the faith where lies the strength of Tibetan People.